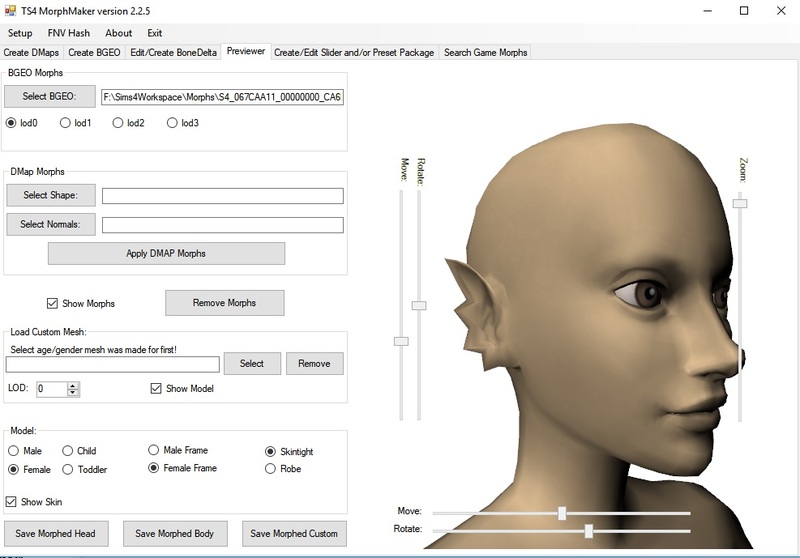 This tool makes custom TS4 morphs from base and morphed meshes and packages them in CAS sliders and presets. 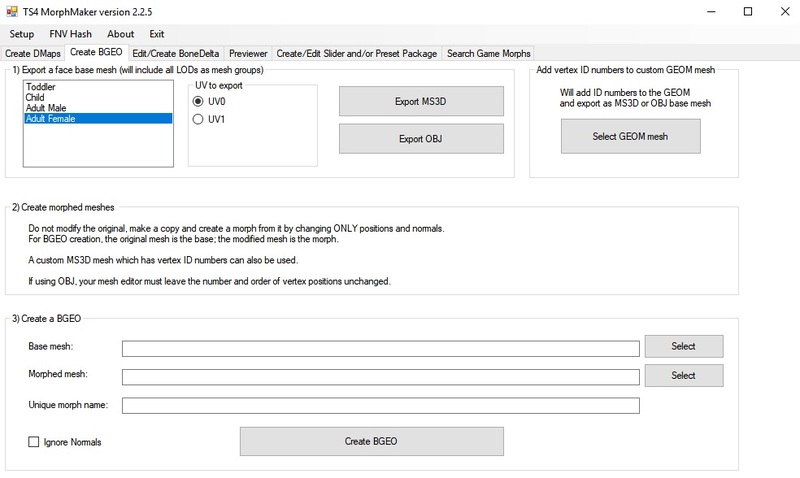 Meshing can be done using any 3D editor that will import and export OBJ without changing the vertex order or the face sequence or the group/object names. Tested with Milkshape and Blender. Check back for updates - now that people are using the tool I'm fixing bugs and updating often. If something doesn't work, please check to see if an update has fixed it. If not, please report any bugs in the comments, giving as much information as possible. Please upload your meshes if you're having trouble making a BGEO or DMap. 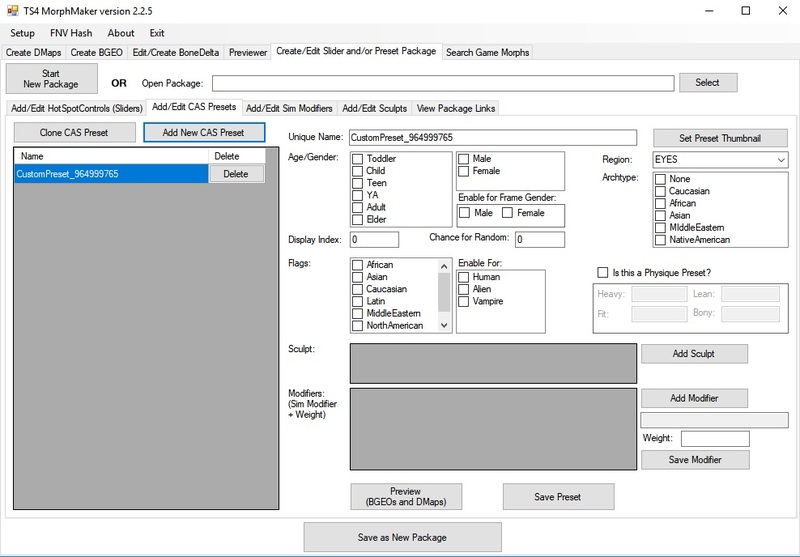 Please upload your package if it's not working as expected in CAS or the game. If you'd rather not upload, pm me with a link. Note that the bone delta editor hasn't had much testing, and that support for morphs of custom meshes is mostly untested. s4pe/s4pi is used by MorphMaker for package and image handling. s4pi/s4pe and MorphMaker are open source. This is a beta since there are a lot of changes, and the previous version is still available until this one is final. Full support for cat and dog sliders and presets added. The DeformerMap creation has been substantially rewritten to produce smoother and more accurate maps which are also a bit faster to make. The problem of morphs 'smearing' into the wrong areas and causing distortion should now be gone. Any bumpiness in very high poly meshes should be gone. *Note this exception: In human sims the fingers and inner mouth are mapped onto the same area of the uv1 so DMap morphs cannot be used for either part without distorting the other. Sculpts now include the full set of textures (material, normalmap, specular) and bone deltas. Bugfix: Export of morphs included tiny inaccuracies due to rounding error causing distortion when exported whole body morphs were used as a morph mesh. This has been corrected. Changes: The thumbnail import/export window will now resize correctly. The preset sort order will display as a decimal number. Bugfix: Correction of bug in HotSpotControl display causing gender restriction flags to be incorrectly checked in some conditions. Changes: Addition of custom regions for Sim Modifiers, for use in body presets meant to affect only one body part. Choice of regions in presets restricted to regions that can have presets. Cosmetic and informational changes to screens. 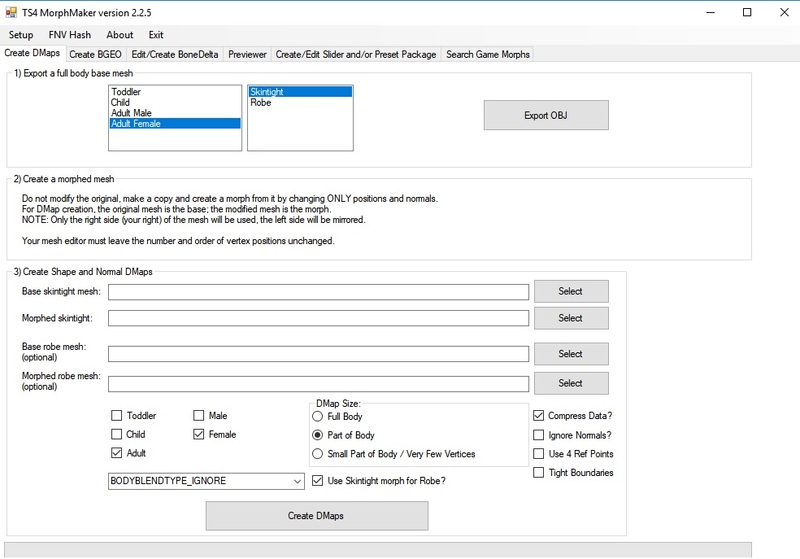 Bugfix: Correction of bug in the Tight Boundaries option of DMap creation which caused erroring out. Changes: Addition of mesh export from all previews, including previews of presets, sculpts, and sim modifiers. Exported meshes can now be modified and used as a morph mesh with the correct standard base mesh for the age/gender. Bugfix: Correction of DMap compression bug introduced in previous fix, affecting base/morph pairs of any size with areas of unchanged normals. Anyone using V2.2.6 should update immediately. Change: Body meshes exported from the Previewer tab will now include the head. Bugfix: Correction of bug in whole body compressed DMap creation, resulting in a DMap with bad data. Anyone working with whole body size DMaps should update. Change: A few user error checks added.